Twitter’s commitment to move faster to make the platform safer started in January. First, the company conducted research to understand the issues at a deeper level, then we made a range of product updates. Then they convened the Trust and Safety Council to gather feedback and help guide them as we they forward. While there is still much work to be done, people are experiencing significantly less abuse on Twitter today than they were six months ago. What follows is some new data on the progress that they’ve made, what they’ve learned, and their plans to continue improving. Twitter is now taking action on 10x the number of abusive accounts every day compared to the same time last year. The platform also now limits account functionality or place suspensions on thousands more abusive accounts each day. There are repeat offenders who create new accounts after being suspended for violations. The new systems, in the last four months alone, have removed twice the number of these types of accounts. Beyond the technology, Twitter teams are continuing to review content daily and improving how we enforce our policies. Communication about problematic Tweets, especially to the people who send them, is key. Accounts that demonstrate abusive behavior are now limited for a time, and told why. Accounts that are put into this period of limited functionality generate 25% fewer abuse reports, and approximately 65% of these accounts are in this state just once. Twitter has introduced new ways to customize people’s experience, including notification filters and muting keywords. The Quality Filter feature has led to fewer unwanted interactions: blocks after @mentions from people that they don’t follow is down 40%. These numbers will vary, but the approach is having a positive impact. Twitter has consistent harassment definitions and policies that apply to everyone. However, people define abuse differently, so using these new tools, every person has control of what they see and experience on Twitter. More improvement, transparency, and speed. 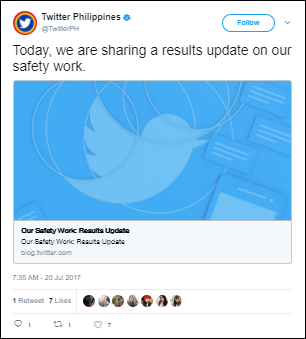 Online safety is an issue best solved in partnership with others, so Twitter will continue to collaborate with the Trust & Safety Council, industry experts, and academics to solicit ongoing feedback. We are committed to making Twitter a safe place for free expression.